Uttarakhand Speaker Govind Singh Kunjwal today appreciated incumbent Chief Minister Harish Rawat’s efforts towards speedy relief measures in disaster-hit areas of the state. Faster relief and rehabilitation works in the disaster-affected areas and restarting the Char Dham yatra on time are still the priority of his government, said Harish Rawat. In a major decision, the Union Cabinet committee formed for rehabilitation in Uttarakhand has approved Rs 7342 crore for the rehabilitation work and the state government has also been sanctioned Rs 1700 crore out of the total amount. During the range level police meeting of district police heads held at Range Headquarters, the Deputy Inspector General of Police (DIG), Garhwal Range, Amit Sinha, has directed the Senior Superintendents of Police (SSPs) and Superintendents of Police (SPs) to start identifying the sensitive and extra-sensitive areas in the districts and to initiate measures to reduce the sensitiveness in the wake of upcoming general elections. Pauri Garhwal MP Satpal Maharaj who recently defected from Congress to Bharatiya Janata Party (BJP) today came out in praise of BJP's prime ministerial candidate Narendra Modi here today. The Uttarakhand election in charge of the BJP, Uma Bharati, today said Haridwar city legislator, Madan Kaushik would be actively participating in the election campaign of Haridwar candidate Ramesh Pokhriyal Nishank. Aam Adami Party (AAP) candidate from Almora Harish Chandra Arya today organised a roadshow in Pithoragarh and requested people to vote for AAP in the ensuing Lok Sabha elections. The District BJP unit and the Akhil Bharatiya Vidyarthi Parishad (ABVP) will motivate their activists to reach out to voters, particularly youths, door to door to ensure that party candidate Ramesh Pokhriyal Nishank wins in the forthcoming Lok Sabha elections by a record margin. 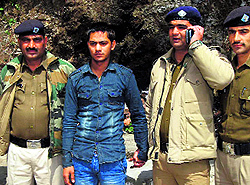 The Mussoorie police that was drawing flak due to the increase in unsolved theft cases in the recent past received a shot in the arm when a Euro plates thief was arrested in Dehradun and brought to Mussoorie for further investigations today. The accused Kashif along with his accomplice Rifakat, who is still absconding, had decamped with Euro number plates from around 14 cars overnight, of which two were private vehicles and others taxis at Kempty stand, Hussain Ganj and Library bus stand area on March 20. In remembrance of Chipko movement, people from all walks of life led by environmentalist Kalyan Singh Rawat of Maiti movement fame today gathered at Gandhi Park, Dehradun, to observe Chipko Divas. On this very day on March 26, 1974, Gaura Devi, a woman in Reni village of Chamoli district started Chipko movement against felling of trees. Setting their foot of the highest mountain in Oceania, Carstensz Pyramid, the twin sisters Tashi and Nungshi set yet another record to become world’s first twin sisters to do so. With this step, the twins have covered five of the world’s seven highest peaks. At 4,884 m, Carstensz Pyramid is located in Indonesia’s extremely remote and rugged West Papua region. It is also the highest point between the Himalayas and the Andes, and the highest ‘island peak’ in the world. Demanding construction of motor roads to their respective villages, the villagers of Silangara valley in Munsiyari and Kotmanya areas of Berinag today demonstrated before District Magistrate's office in Pithoragarh and submitted a memorandum to District Election Officer,threatening not to vote in the coming elections if the respective roads are not constructed soon. The members of Jai Maa Santoshi Taxi-Jeep Union demanded immediate repair of the Char Dham route and relaxation in the insurance norm for the vehicles associated with their organisation, in a meeting held at Thatyur block in Tehri district, today. Reacting sharply to the increase in the prices of daily utility items, Brig KG Behl (retd), district president, All India Consumer Council, said that it is affecting consumers who have to pay through their nose. 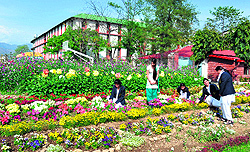 A flower show was organised at Sardar Bhagwan Singh Postgraduate Institute of Biomedical Sciences and Research (SBSPGI), Balawala, here today. The show was inaugurated by Harinder Pal Kaur, wife of founder director of the institute the Late Gurcharan Singh. On a call given by the Uttarakhand Chemists Federation, the chemists in Dehradun have decided to go on a one-day strike and stage a protest outside the office of the district administration on March 28. Despite spending nearly Rs 12 lakh on the so-called river cleaning campaign, the situation has gone from bad to worse. Handled jointly by the Mussoorie Dehradun Development Authority and Dehradun Municipal Corporation, the project that was launched by Chief Minister Harish Rawat, soon after taking over the reins of the state is nowhere to be seen. A case has been registered in the Dalanwala police station against two persons for allegedly duping one person of Rs 1 lakh in the name of getting him a job in USA. Thieves have struck at the high-security Dehradun District Court premises and stole electronic fittings and other electronic equipment from one of the old buildings. A tiger killed a man and two goats in Dhikuli village in the Sarpduli range of the Corbett tiger reserve. Petroleum University won its match by 7 runs against Uttaranchal University in the ongoing Shiwalik 20Twenty Cricket Tournament played at Rangers College Ground here today. Addressing a day’s workshop - Learning from the Uttarakhand Disaster (June, 2013) for the Indian Himalayan Region - organised by Central Himalayan Environment Association (CHEA) and Centre for Ecology Development and Research (CEDAR) in association with Forest Research Institute, Kunjwal said the incumbent Chief Minister had given powers to the Sub-Divisional magistrate for sanctioning Rs 1 crore, which he said will ensure speedy relief activities in disaster-hit areas. Kunjwal also expressed concern over the growing tendency of making monetary gains among politicians and administrative officials, especially in the recent times, which has made an adverse impact on the developmental priorities and required action on extreme events of disaster in the country. Earlier, FRI Director Dr PP Bhojvaid talked about the role of research institutions for collaborative efforts for disaster management and knowledge generation as well its dissemination among the stakeholders. “Developing synergy among the institutes working in the Himalayan states, especially in Uttarakhand can contribute in building the capacities of rural communities in the area of disaster,” said Dr Bhojvaid. Former Vice-Chancellor Garhwal University Prof SP Singh stressed on the need for knowledge sharing among the mountain states linked to disasters. He cited an example of landslides, which equally affects the entire Himalayan region spread over 2400 kms from Jammu Kashmir to Arunanchal Pradesh. Prof Singh pointed out the need for blending of engineering, technology and ecological aspects to ensure the developmental planning is sustainable and called for collective research by the mountain states in this direction. Former Vice-Chancellor of Kumaon University and Chair of Doon Library and Research Centre Prof BK Joshi raised the governance issues in managing disasters. He spelt out immediate action points such as attention and implementation of National Disaster Management Agency guidelines with state specific requirements, strengthening the information system by involving Indian Metrological Department and involvement of local administration and communities in the planning for disaster management and mitigation. Uttarakhand RED-GIZ Programme Manager Subroto Roy gave an account of the background of the efforts made and said in today’s world it is vital to share knowledge an information. He stressed the importance of use of technology in the field of disaster management. Dr Pushkin Phartiyal, Executive Director of CHEA mentioned that the major learning from the Uttarakhand disaster emerged for valuation of the ecosystem services through involvement of the central government and regional level. Dr Pushkin gave example of the flow of ecosystem services from the mountain region to the Indo-Gangetic plains where more than 500 million populations have been benefited for the last 5,000 years. Executive Director Meteorological Department Dehradun Dr Anand Sharma and Dr PS Negi of Wadia Institute of Himalayan Geology were other key speakers at the workshop. Faster relief and rehabilitation works in the disaster-affected areas and restarting the Char Dham yatra on time are still the priority of his government, said Harish Rawat in the report card of the works done by his government released today. Rawat took over as the Chief Minister of the state on February 1, 2014. He has been under attack from his opponents, particularly Satpal Maharaj, who has defected to the BJP and accused him of dong nothing for the state as a Member of Parliament and Union Water Resources Minister. Harish Rawat said faster relief work in the disaster-affected areas and restarting the Char Dham yatra on time were still the priority of his government. Besides taking a number of decisions on the developmental front, his government had delegated selection, financial and administration powers to project implementation units (PIUs) in the disaster-affected areas, he added. “I am happy that 65 PIUs headed by Sub-Divisional Magistrates, 13 by District Magistrates and two headed by Commissioners are doing faster reconstruction works in the disaster affected areas,” he said. With an eye on the Lok Sabha elections, the Chief Minster said he had plans to build up to four new townships in each district of the state. “If the plan is successful we can further improve it by providing basic urban infrastructure facilities to the people,” Harish Rawat said. Rawat added that his government proposed to synchronise road connectivity with employment generation activities in the state. “We propose to build markets on road in major townships in which shops will be given to local entrepreneurs,” he said. Regarding growing unemployment and migration from hill areas, the Chief Minister said his government had initiated steps to have an Uttarakhand-centric employment policy and a three-member ministerial group had been formed to work on policy formulation. He also announced that water supply to all schemes, which were damaged in the natural disaster last year, would be repaired and restarted by April 15. Similarly, the work was also going on to replace power lines to reduce line losses and give better quality of power to consumers in the state. The Chief Minister said efforts had been made to clean the Rispana and Bindal rivers passing through Dehradun city so that these could be beautified and used for future transportation. “I have invited experts to look into these aspects,” he added. 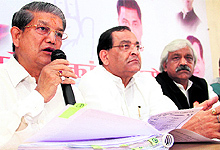 Rawat said after the Lok Sabha poll his government would focus on the implementation of the Food Security Scheme, which would cover 62 per cent of the population. “We have taken a decision that the remaining 38 per cent population would also be provided cheap food grains with emphasis on iron and iodine deficiencies,” he added. In the health sector, the Chief Minister said on the lines of the National Health Insurance Scheme, a similar scheme called ‘Chief Minister Health Insurance’ would be launched in the state in June 2014. “We will provide a health insurance cover up to Rs 30,000 to everyone and those who are unable to pay their medical expenses will be compensated by 50 per cent from Chief Minister’s Relief fund,” he announced. The Chief Minister also announced his plans to rejuvenate agriculture in hill areas in the state for which an incentive of Rs 1 crore would be given to villages opting for ‘Chakbandi’. “We are also encouraging the cluster-based agriculture approach in the plains and focusing on fencing of villages near forests. We will also encourage farmers and villagers to grow fodder, besides developing pastures in the hills,” Rawat said. The Chief Minister announced that the Rajiv Gandhi Institute of Traditional Technologies would be set up to preserve and improve traditional crafts. In a major decision, the Union Cabinet committee formed for rehabilitation in Uttarakhand has approved Rs 7342 crore for the rehabilitation work and the state government has also been sanctioned Rs 1700 crore out of the total amount. This money is being used for the work of road construction, drinking water, irrigation, tourism and housing. The Chief Secretary Subhash Kumar presided over a meeting of the high level committee constituted for disaster management of the state government here today. During the meeting, it was informed that an amount of Rs 500 crore for PWD, Rs 250 crore for drinking water, Rs 556 crore for irrigation, Rs. 26 crore for tourism development and Rs 60 crore for development of houses has already been released. A sum of Rs 108 crore has been finalised for road construction. The reconstruction work will begin within one week. A total of 15 bailey bridges have been prepared for sudden requirement and a sum of Rs 556 crore have been arranged for flood control under irrigation department. Under the sanctioned amount, huts will be developed on the major tourism routes and Kedarnath town will be re-developed and a sum of Rs 26 crore has been sanctioned for this. Besides this, Rs 350 crore has been sanctioned for Special Plan Assistance. The Tourism Department will develop Char Dham with Rs 200 crore budget. Drinking water arrangements will be made in 9 towns in char dham areas from a budget of Rs 70 crore. The work on the remaining projects will begin by April 20. Drinking water services have been resumed from Kedarnath to Bheembali near Badrinath. Helipads are also being constructed out of which 20 are small and 40 are big. Besides this, all helipads will have a multipurpose hall with Rs 30 crore budget. All houses which were damaged during the disaster will be repaired. Out of 2475 houses to be repaired, work has begun on 404 houses. A total of 4 designs have been prepared for these houses. These houses are being repaired according to the consent of the owner. Geological Survey of India has already conducted a survey for the very same purpose. Similarly, reconstruction work of hospitals, schools, godowns, polytechnics, ITIs and government buildings has already begun. A total of Rs 200 crore has been allotted for technical assistance. Under this arrangement, strategies will be made for risk management, slope stabilisation study, river morphology study, formation of State Disaster Management Authority, strengthening of emergency response system and early warning system. Uttarakhand Chief Secretary Subhash Kumar today said that a strong system is being made for effective implementation of these projects. Project management unit has also been constituted, which is being headed by Secretary, Public Works Department, Amit Negi. The Chief Secretary said that several committees have been constituted for several departments. He apprised that additional secretary Dilip Jawalkar is the project manager for road and bride development unit. Uttarakhand Additional Chief Secretary Rakesh Sharma and Principal Secretary MH Khan were other prominent officials present on the occasion. The district police heads of seven districts were directed to start touring the sensitive places and make a list of anti-social elements who can be a threat to the peaceful conduct of the elections and take all preventive steps. The DIG also gave strict directions regarding curbing of supply of illegal liquor, arms and money in the wake of general elections and all steps must be taken to ensue peaceful passage of general elections in the Garhwal area districts. Especially, the police heads of Dehradun, Haridwar, Pauri and Uttarkashi, which share boundary with Uttar Pradesh and Himachal Pradesh, were told to keep a close vigil on the inter-state border points and to erect barricading for checking. For the upcoming Char Dham Yatra, the DIG asked the SPs to set up early warning teams for identifying the accident-prone areas. Satpal Maharaj who came to the state BJP office for the first time after joining the party was welcomed by senior party leaders. Talking to media persons, Maharaj said that he joined the BJP after getting impressed by Narendra Modi. He said that he sees the image of great world statesmen like Winston Churchill, Abraham Lincoln and Sardar Patel in Narendra Modi. Maharaj said that it was only Modi who could steer the country which is facing lot of challenges. He said that being Chairman of the parliamentary committee of defence, he was aware of the problems faced by the armed forces. He charged that the country has been surrounded by China on one hand and Pakistan on the other. He alleged that China has been moving inch by inch on Indian territory while our Navy is ill-prepared to deal with the Chinese challenge in the Indian Ocean. Maharaj said that China was as backward as India 40 years ago but with able leadership, the country has transformed itself into a world power. “ I am sure with Modi as Prime Minister ,India could attain its place in the leading powers of the world,” he said. Interestingly, it was Satpal Maharaj who had taken out “sadbhavna” rallies in Gujarat after the 2002 communal riots in the state. Maharaj also spoke about his contribution to the struggle for a separate state of Uttarakhand. He claimed that it was due to his efforts that the then Prime Minister HD Deve Gowda in 1996 for the first time announced the formation of Uttarakhand which was reiterated by Prime Minister IK Gujral from Red Fort in his August 15 speech. Addressing an election meeting yesterday at a media brief, Uma Bharati, who herself is contesting from the Jhansi parliamentary constituency, said that it has of late been a trend of BJP leaders to show their resentment over denial of ticket allocation, so much should not be taken out of this. Former Madhya Pradesh Chief Minister said that Madan Kaushik had apprised her of the reason of his absence from the election meeting. Soon, Kaushik will be actively campaigning for Nishank, as both shared good relationship. The former was Cabinet minister in latter’s state Cabinet in the previous Assembly, said Bharati. “We all should work as party activists first. The real leader is one who takes others along with him even if he was denied the ticket. If this is not the case then we are just traders. I myself was asked to contest from Haridwar seat by all the ticket aspirants from this constituency two months back. But the party gave me directions to contest from Jhansi, as the party high command takes decision in larger and broader perspective," said Bharati, who is currently a legislator from Uttar Pradesh. While, Ramesh Pokhriyal Nishank said that he is getting overwhelming support of party cadre and had personally met Kaushik at his Khanna Nagar residence, where both held talks on election campaign and political aspects. Uma left Haridwar within three hours after arriving in the city, giving necessary instructions to Nishank, state general secretary Prakash Pant, district unit president Kuldeep Gupta, legislators Aadesh Chauhan, Chandrasekhar Bhattewala, Swami Yatishwaranand and Sanjay Gupta. Arya, while interacting with voters, said he had been associated with the anti-corruption movement of Arvind Kejriwal from the very beginning and this was the reason that he had got the party ticket from Almora. The AAP candidate started his roadshow from Salt and Bhikiasain subdivisions of Almora district from March 19. After holding roadshows in subdivisions of Almora, Bageshwar and Pithoragarh districts, he would meet people in Lohaghat and Champawat districts. Arya said migration from remote and higher villages of the hilly state had become a major concern. “The successive governments have failed to introduce a policy on forests and local resources. They remained more interested in commercial interests and ignored the problems of the people," he alleged. He said if he was voted to power, his main focus would be on introducing a policy on forests, water and tourism. He said job apportunities would also be created for the local youth. Two meetings were held separately at the camp election office of Nishank and at the ABVP city unit office at Devpura in this regard. Addressing party activists, district unit president Kuldeep Gupta said that the youth would be key to this election as a large number of young voters would be casting votes this time. Gupta said to connect with the young voters, youth activists of the party would have to reach out to them personally. “There is a strong wave in favour of the BJP and Narendra Modi in the country. The youth want a change and we will provide them a corruption- free, and development-oriented regime. The youth has a major role to play in this election as the country is waiting for a major change, that was for a short span provided from 1999-2004 when Atal Bihari Vajpayee became Prime Minister. Now, it is the turn of Narendra Modi,who will change the working of the government in just 60 months time, but for that young party activists have to toil that much hard,” said Gupta. At Akhil Bharatiya Vidyarthi Parishad city office state unit organisational secretary Ramesh Gadiya said that the student outfit will play a pivotal role in this election, for which all the 13 district executive committees are being mobilised. Ramesh said as a major percentage of voters will be casting vote for the first time, it is the responsibility of ABVP activists to draw them towards BJP ideology, as Narendra Modi has the vision and concern to look into the youth affairs too. Garhwal division coordinator Naveen Pant said that ABVP will actively work for election campaign in the three seats of Garhwal division, Pauri Garhwal,Tehri Garhwal, Haridwar and two in Kumaon division, Almora-Pithoragarh and Nainital-Udham Singh Nagar. The Mussoorie police that was drawing flak due to the increase in unsolved theft cases in the recent past received a shot in the arm when a Euro plates thief was arrested in Dehradun and brought to Mussoorie for further investigations today. The accused Kashif along with his accomplice Rifakat, who is still absconding, had decamped with Euro number plates from around 14 cars overnight, of which two were private vehicles and others taxis at Kempty stand, Hussain Ganj and Library bus stand area on March 20. The police acting on the written complaint of theft filed by the president of taxi union Hukum Singh began investigating the CCTV footage from the cameras installed by the shopkeepers at Kingcraig, Picture Palace, Aquarium, Library and Kempty stand and found that a silver Indica car number DL7CE 59 was seen entering Mall Road from Picture Palace around 2 am and headed towards Dehradun after stealing the Euro plates at various points of the town around 4 am on March 20. The police on the basis of the clue started enquiring about the vehicle and found that it was registered in the name of Jitendar, resident of JJ Colony, Delhi. The investigation team was rushed to Delhi where they were informed by the owner that the vehicle was in possession of Kashif, resident of Khoda Colony in Delhi, and he had left for Dehradun to leave commuters on the day of the incident. The investigating team started searching the vehicle at Dehradun and after a tip-off, apprehended Kashif at Turner Road bend near Saharanpur road, along with the vehicle used in the crime. The police also found stolen LCD, music system with original papers of the vehicle used in the crime in his possession. He was brought to Mussoorie where during investigations Kashif divulged that Rifakat Ali alias Bhayya, resident of Jujai B-29 Indira Camp, Trilokpuri in New Delhi, was his partner in the crime and it was Rifakat who sold the stolen Euro plates in Delhi. The police station incharge Jaimal Nigam informed the mediapersons that a team has been sent to Delhi to nab the other accomplice. He also revealed that Kashif is already facing a number of theft cases in his name and the other accomplice who is yet to be apprehended has also been booked in several cases of theft and murder. The police have booked the case against the accused under various sections of Indian Penal Code and sent him to Dehradun to be presented in the court today. The members of taxi union have hailed the police team consisting of Sub-Inspectors Sohan Rawat, Rituraj Singh, Riyaz Ahmed, constable Manoj Bharti, Amrendar Singh, Girvir Singh and Dharmendar Singh for their efforts in nabbing the culprits. Addressing the gathering, Kalyan Singh Rawat referred to the sacrifices made by hill women for the conservation of environment. Rawat underlined the importance of environment conservation. “Rampant exploitation of nature was adversely affecting the health quality of life,” Rawat said adding that it was collective responsibility to work for the conservation. He said today was 40th anniversary of Chipko movement and all the people must today pledge to work for protecting trees. Jagar singer Basanti Bisht said the women of Uttarakhand have always worked for the cause of environment conservation. Women in large numbers who had gathered at the Gandhi Park also garlanded the portrait at Gaura Devi. 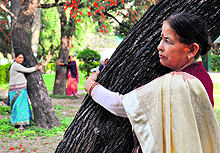 They also symbolically embraced trees at Gandhi Park to mark the Chipko anniversary. Setting their foot of the highest mountain in Oceania, Carstensz Pyramid, the twin sisters Tashi and Nungshi set yet another record to become world’s first twin sisters to do so. With this step, the twins have covered five of the world’s seven highest peaks. At 4,884 m, Carstensz Pyramid is located in Indonesia’s extremely remote and rugged West Papua region. It is also the highest point between the Himalayas and the Andes, and the highest ‘island peak’ in the world. Carstensz Pyramid is known as the most technical climb of the Seven Summits and remains one of the least climbed due to its remote location and difficulty of access. The access route to the mountain is notorious for being called the toughest trek in the world. Speaking about the journey, the twin sisters said that it was a tough climb coupled with deep mud, climbing over huge roots and fallen trees in the jungle, overwhelming heat, constant rain and long days. 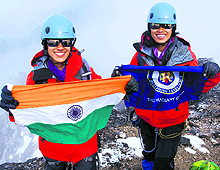 The twin sisters’ expedition comprising 10 members reached the base camp after six days of gruelling hike. The team comprised two Pakistanis, two from Emirates, three Canadians and an Australian. “The final summit attempt was equally arduous. Carstensz is very steep with razor sharp rock with no room for error. We had to complete Tyrolean Traverse by undertaking dangerous jumps over wide rock gaps and had to rappel down 80 per cent of the mountain. Sometimes the trek continued into nights as valuable morning hours were lost due to the unpredictable nature of the local porters who repeatedly sat down in protest to demand more money. Several of the porters left midway during the trek,” said Tashi. “The unique feature of these tropical mountains is that they are located just four degrees south of the equator and are one of the very few places in the world where permanent ice can be seen almost directly on the equator. In addition to its comparative technical difficulties, Carstensz Pyramid remains a difficult climb due to its old fixed ropes, often dangerously worn out by the constant rain and the sharp limestone edges,” said Nungshi. Villagers from over a dozen villages of Silangara valley in Munsiyari subdivision have said that they have informed district election officer about their decision of not casting votes in the coming parliamentary elections as they have been neglected by the administration and the government since the year 2003 as the road sanctioned that time for their villages has not yet been constructed. According to the villagers, not only the road has not reached in their villages, but the educational facilities are also lacking as the only high school in the area has not yet been upgraded. ''Due to that negligence, the villages of Siri, Chama, Khatera and Napar of the valley are still suffering as the students from the valley have to walk 30 km to get education up to intermediate level,'' said Bharav Datt, leader of the delagation. ''Not only do we suffer due to poor state of roads and education, but on medical ground, too, over 10,000 villagers of the valley are suffering as the lone ANM centre in the area is running without staff for the last three years,'' said Bharav Dutt. The villagers of Lotmanya valley in Berinag subdivision also reached the district headquarters today and demanded construction of 6 km long motor road from Kotmanya to Taurathal village. The villagers have threatened that they will boycott the coming elections if their demands are not met in time. The members of the union also presented a memorandum in this regard to the District Magistrate, Tehri, on the occasion. According to the president of the Jai Maa Santoshi Taxi-Jeep union Charan Singh Panwar while discussing the issues related to their organisation the members lamented the fact that the condition of Char Dham route is not conducive to ferry vehicles even after nine months of the natural disaster that occurred last year and if the route is not repaired soon the taxi-jeep union members would have to face immense difficulties during the Yatra season, which is scheduled to begin soon. The patron of the union Sunil Thapliyal, speaking on the occasion, also informed the gathering that the union members were already facing financial crisis due to last year’s natural disaster and despite that were being asked to pay insurance four times more than the amount sought last year which would only spell losses for the members struggling to come out of the losses faced by them last year. The members demanded immediate repair of the Char Dham route and relaxation in the insurance amount to be paid by the members of the association. Thapliyal said the Tehri DM assured to look into the matter and provide some relief in the near future. In a press release issued here, Brig KG Behl (retd.) said that a number of people have resented the exorbitant increase in prices of certain items that in turn are affecting the prices of daily utility items. “It has been found that due to elections the concerned parties are pressurising the dealers and trying to extort funds to fight elections and in the process asking them to raise the prices of their products to that extent. For example the price of a bag of cement has gone up by Rs. 80 and prices of bricks and other building material have increased, too. There is no control or check by the officials,” he said. “Due to election code of conduct in place, the government is not authorised to raise the prices of different items without the permission of the Election Commission. Does this code not apply to private companies, where the prices are being raised exorbitantly? This amounts to open cheating and EC must put pressure on the respective governments to take suitable action against the culprits,” he added. On one side the government is trying to check and control the price hike of the daily use products, on the other they are not exercising any check on such hike in prices. It must introduce certain checks and controls so that this hike in prices, corruption and adulteration could be stopped. The Chief Minister is requested to look into this aspect and take action,” said the retired Brigadier. Varieties of flowers such as Petunia, Geranium, Fuschia, Kalanchoe and Pansy with Vanhoume spira were displayed and the guests were welcomed. All details of flowers were presented in the show. A large number of students and teachers were present during the show. The other dignitaries present were SP Singh, chairman of the institute, Retd Brig PPS Pahwa, Additional Director, Captain JS Gill, Prof Versha Parcha and others were also present. In a press note issued here today, Raj Kumar Aggarwal, general secretary of the federation, said they demanded scrapping of the compulsory online registration of sale of narcotic drugs and psychotropic substances. "We will be submitting a memorandum of our demands to the City Magistrate," he said. Umesh Joshi, Chandrashekhar Pant, Tapan Aggarwal, Narendra Sahni, RK Sotia and others were present at the meeting. Under the project, funded by the state government, the riverbeds of three prominent seasonal rivers were to be cleaned.These are Rispana, Bindaal and Choti Bindaal. In the first phase, the work on Rispana was started in the second week of February. 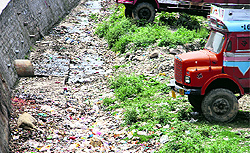 Daily labourers and vehicles were deployed by the MDDA for handpicking the garbage strewn on the river beds. The move drew a lot of flak from the Opposition and DMC Mayor Vinod Chamoli, who termed the project as a sheer wastage of public money. In the absence of any permanent measure to stop the dumping of garbage in the riverbeds, they have only got filthier than before. The same areas where the garbage was cleared off a few days ago present a sore sight with the bigger dumps back at the same spot. Speaking to The Tribune Additional Mukhya Nagar Adhikari Banshidhar Tiwari said that the work on cleaning the rivers is very much on. “For few days it was disrupted because of the holidays and unavailability of the labourers. We keep on changing the place every day for clearing the riverbeds. Till the time the public does not become aware of the dumping of garbage, the situation is going to persist despite every effort taken by the authorities,” he said. ''We would soon be setting up six feet high wire mesh on the riverbanks so that people are not able to throw the waste in the river. Also the proposals have been received for mining in the river and would be finalised after the elections. It would help solve the problem to a great extent,” he said. Reportedly, Sachin Chamoli who works with one multi national Human Resource Company, which sends persons abroad for jobs and has an office at Dalanwala, filed a complaint against two of his senior executives of the company for duping him of Rs 1 lakh by promising him a job in the headquarters of the firm situated in California, United States. According to Sachin, he was promised a job in the company's headquarters by Ankur Sinha and Santosh Kumar but they failed to provide him the promised job despite taking money from him. Meanwhile, he approached the police a number of times before but the police were not ready to file his complaint. But now on the directions of the court, Dalanwala police station has filed the complaint and started the investigations in the case. Thieves have struck at the high-security Dehradun District Court premises and stole electronic fittings and other electronic equipment from one of the old buildings. The thieves reportedly broke the windows of a store in one of the buildings of the Chief Judicial Magistrate (CJM) court and took away electronic fittings like fans, tube lights, switches and other electronic equipment. The incident came to light when the employees of the store department reached office and noticed the things missing. They reported the incident to the Kotwali police. Deputy Director, Corbett Tiger Reserve, Saket Badola said the deceased, Gopal Singh, was grazing his goats when a tiger attacked him and two of the goats. Badola said they had installed camera traps to track the movement of tigers and leopards in the region. After winning the toss and electing to bat first, Petroleum University made 108 runs with Sooraj making highest 25 runs while Maddy made quick 19 runs. In reply, Uttaranchal University were bowled out 7 runs short of the total. Mohit made highest 22 runs for Uttaranchal University in the match. 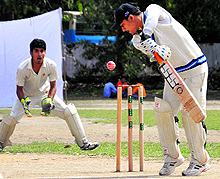 In the second match, College of Engineering Roorkee (COER) thrashed Dwarahat cricket team by 9 wickets. Batting first, Dawarahat made just 59 runs in 20 overs with Jaipal making maximum 20 runs. For COER, Ankit Dhami and Ashu took 2 wickets each against Dwarahat. In reply, COER comfortably chased down the target at the loss of just 1 wicket with Ayush making highest 25 runs. The Doon Warrior Cricket Club defeated the UPCL cricket team by 9 wickets in the ongoing 62nd District Cricket League played at OFD Ground here today. Batting first, the UPCL team made 185 runs in the 30 overs. Anil made an unbeaten 61 runs while Pankaj scored 59 runs. Chandra and Pushpender also played small cameos and helped their team to reach a comfortable score. In reply, the openers of Doon Warriors gave their team a good start with Rishabh and Aakash playing brilliant innings of 84 and 66 runs, respectively. The team easily achieved the target for the loss of just 1 wicket and won the match comfortably. In the second match, Sports College defeated MPS College by 136 runs. Sports College won the toss and elected to bat first. It made 225 runs with Paramveer scoring the highest 60 runs followed by Prashant’s 28. However, MPS College got off to a dismal start with its frontline batsmen getting out cheap. Except Anshul and Saurabh’s 20 and 22 runs, respectively, no other batsman could even reach the double figure. The whole team was bundled out for just 89 runs.